Check out our latest posts on winning bids and proposals. In my last post, I discussed some of the processes to put in place before tendering for work but it’s also important that you have the right people and skills in order to win tenders. If you’re a small business, you might not be in a position to recruit dedicated work-winning staff at this stage so it’s worth considering the skills you will need and where these might already exist in your organisation. 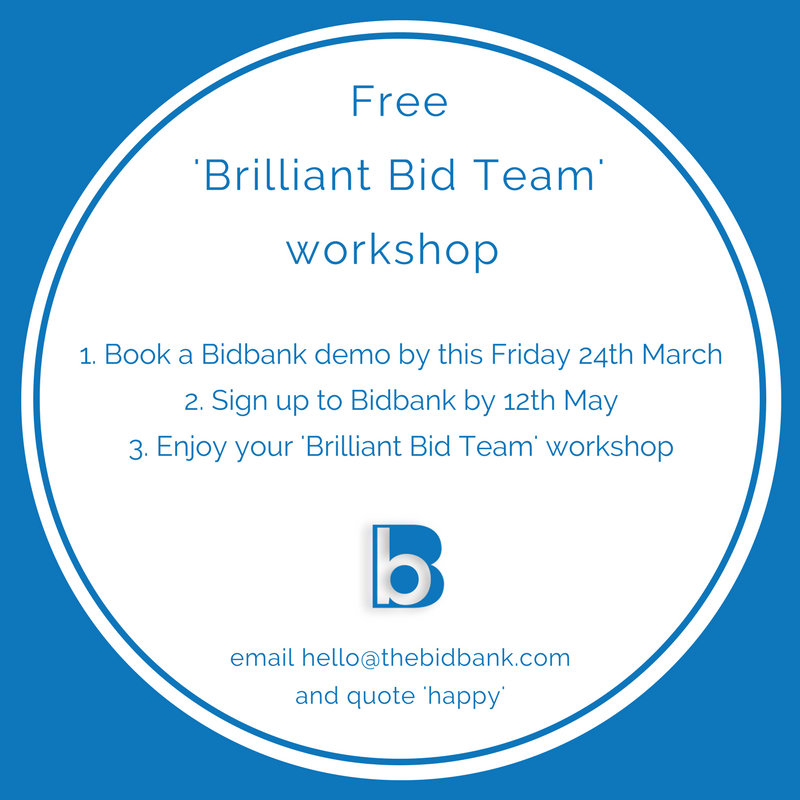 To celebrate International Day of Happiness, we’re giving away free ‘brilliant bid team’ workshops. Book a Bidbank demo this week and sign up to Bidbank before 12th May to enjoy your free half day workshop. Bidbank creates happy bid teams by bringing together your bid library, management and production to save time and help you and your teams work more efficiently. I often write about the challenges facing established bid teams but if you’re completely new to tendering for work, you might be wondering where to start. If 2017 is the year you wish to grow your business through tendering, here are some suggestions on how you can be bid ready. It can be difficult to think about possible efficiencies and improvements when you’re busy doing the day job but investing a little time now can help you work smarter and produce better bids in the future. Whilst your bid and business development teams have made a career out of writing or managing bids, it’s possible that your technical staff don’t share their enthusiasm or experience. Before assigning bid responsibilities to your technical teams, it’s worth considering their experience and motivation for writing a winning response. Bidding has a bad reputation but I believe by focusing on 3Ps – your processes, people and proposition – we can all bid a little smarter and perhaps even enjoy it!